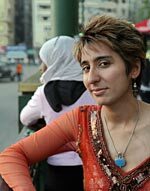 Irshad Manji is an outspoken advocate for reform within Islam. Her best-selling book The Trouble with Islam Today: A Muslim's Call for Reform in Her Faith continues to spark lively debates. The New York Times describes Irshad Manji as “Osama bin Laden’s worst nightmare.” She takes that as a compliment. Manji is the best-selling author of The Trouble with Islam Today: A Muslim’s Call for Reform in Her Faith. Her book has been published in 26 countries, including Pakistan, India, Lebanon and Turkey. In those countries that have banned The Trouble with Islam Today, she is reaching readers by posting free translations on her web site. As a scholar, Manji is Senior Fellow with the European Foundation for Democracy. She recently served as Visiting Fellow at Yale University and Writer-In-Residence at the University of Toronto. As a journalist, Manji’s columns are distributed worldwide by the New York Times Syndicate. In that capacity, she addresses audiences as diverse as Amnesty International, the Pentagon and the Royal Canadian Mounted Police. As an activist, Manji is president of Project Ijtihad, an Internet initiative to revive Islam’s own tradition of dissent and debate. For her social entrepreneurship, the World Economic Forum has selected her as a Young Global Leader. Oprah Winfrey recently honored Manji with the first annual Chutzpah Award for “audacity, nerve, boldness and conviction.” Ms. magazine named her a Feminist for the 21st Century, and New York-based Immigration Equality gave her its Global Vision Prize. Above all, The Jakarta Post in Indonesia — the world’s largest Muslim country — identifies Manji as one of three Muslim women creating positive change in Islam today. Former bodyguard of Osama bin Laden, who despite "deprogramming" efforts by the Yemi authorities, still believes in the call for Jihad. President of Spain's Islamic Commission, he issued a fatwa (legal opinion) against Al-Qaeda following the Madrid train bombings – one of few Muslim leaders to take such an extraordinary step. Among the most recognized dissidents in the world of Islam, Hirsi Ali is a Somali refugee to the Netherlands, a former member of the Dutch Parliament, and now a writer in the U.S.
Irshad Manji’s mother, a devout Muslim who doesn’t always agree with her daughter. A young rapper who sings about all of us getting along, he lives in the Muslim ghetto of north Amsterdam - a relatively poor enclave lined with satellite dishes to receive TV programs (and anti-Western messages) from the Arab world. A passionate writer who defies the social and cultural norms of Yemen by refusing to wear the burqa or niqab (face veil). A moroccan immigrant to Spain, Jamila lost her only child in the Madrid train bombings. She talks about her feelings of the fact that Muslims took a fellow Muslim. As head of the Islamic Supreme Council of Canada, Imam Syed is one of Manji’s fiercest and most articulate Muslim critics. A native Californian who converted to Islam while studying at UCLA, she subsequently married her college sweetheart, Mohammed, and moved to Yemen.